Jasper is a SUPer’s paradise. This national gem could have easily been called “Many Lakes” or “Glassy Emerald Lakes” or something as equally as effusive to describe how central the lakes are to the landscape and activities in this national park. But not only are they plenty; they are smooth, peaceful,clear and all have good access. Heading up to Maligne Lake is worth the 46 km/45 min drive alone from the Jasper townsite for the beautiful scenery, wild life viewing and the many attractions like Medicine Lake and Maligne Canyon to stop at on the way for a full day of activities. Maligne Lake, the end point on the Maligne Lake Road drive, is the largest and most popular of the lakes in Jasper; attracting large crowds near the north end of the lake where canoe and kayak rentals are available and where you will find the trail head for many iconic Jasper day-hikes. If you can get on the road early (we left the townsite around 6:30 a.m.), you may be treated to some heavy fog, rising sun, and a lonesome quiet drive through single-lane picturesque mountain roads. Because you can paddle for hours here, it is a great place to pack a lunch and plan to be out for the day and you will only probably scratch the surface of all the hidden coves and inlets you can see in the first four miles of the lake. We made it out close to the four mile mark before we found a beach where we cooked up lunch with our jetboil and nibbled on sandwiches we picked up from the Bear’s Paw Bakery in town. If you are doing this, plan to bring lots of water. We each brought two litres and packed our water filter just in case. When we set out around 8 a.m., there was still a heavy fog on the lake and it was quite cold we so were dressed very warmly and opted to stay fully covered for most of our paddle to avoid extreme exposure. We were very happy with our decision to set out early as by the time we arrived back to shore around 2 pm, there were probably about 50 canoes and kayaks to manoever around and the crowds were pretty intense. 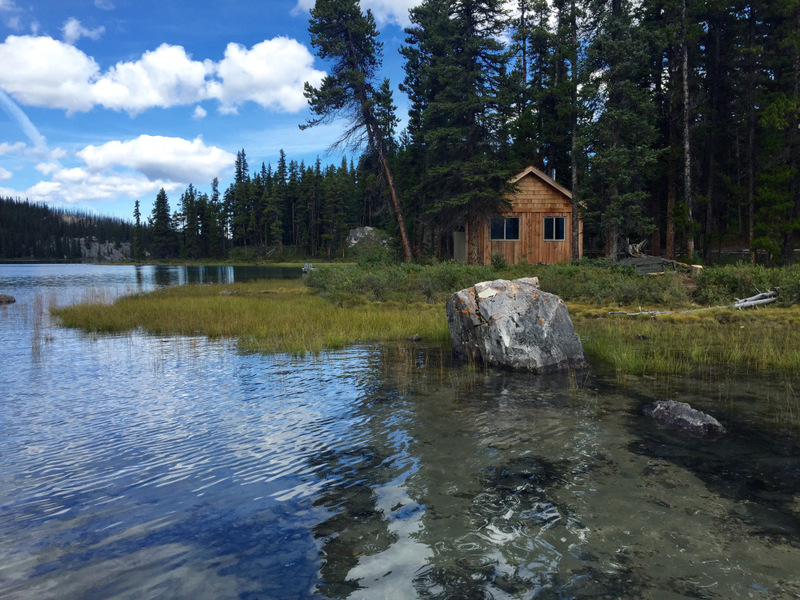 Venture out a bit further than the 1-hour rental folks and you will be treated to pristine mountain views, quiet inlets and if you are lucky some wildlife venturing near the shore. 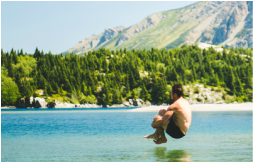 You will have the added advantage of reaching the shore before the heavy crowds, tourist buses and throngs of selfie-stick toting lake-goers fill the area around the boat docks. 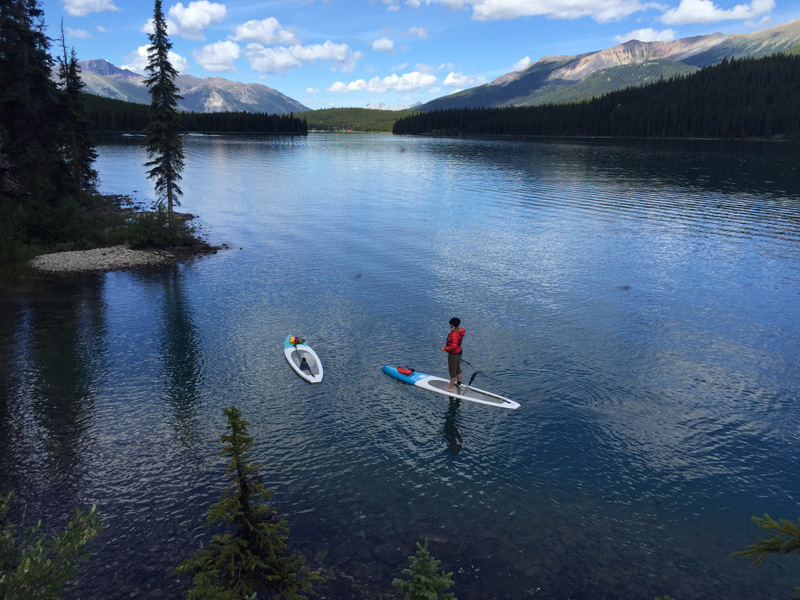 The lake itself is about 22km long, so a day SUP journey might only take you a fraction of this distance; although overnight backcountry lakeside camping is available and can be booked through Parks Canada. The closest campsite is about 5km from your start and is literally a hidden cove. We will definitely try to come back to do a multi-day trip in the future. 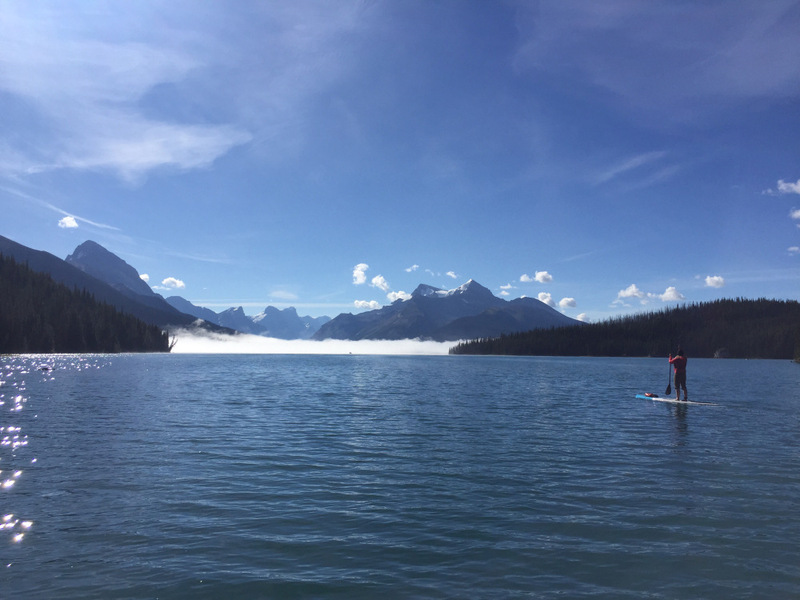 Pros: We would go back due to the sheer size of Maligne Lake and the opportunities to tour to some campgrounds and spots to explore even on a day-trip. Most lakes that are this calm and clear usually are finished in an hour or two. If you are looking for a long day-trip and paddle and time to stop and get off your board to climb boulders, picnic or nap, this is a great spot for you. Cons: Boat traffic travels north and south on the lake every 10 or 15 minutes after 9 am; touring visitors down to Spriti Island and back. This adds a bit of noise and a small wake to deal with however, they seemed to be quite respectful and conscious of paddlers and slowed down each time they passed, which we can’t say for many other lakes with private motorized boats.